A simple black sweaterdress from Salt. I have accessorized it with a Truth Hair called "Jean", one of my go-to 5th & Oxford skins, Shiny Things Kelseys, and the Carmen hosiery from Insolence. I was wearing this dress while socializing. For my sake I usually don't wear cocktail or evening dresses in the daytime (unless the event or venue is formal), so I have a bunch of go-to daytime wear. Simple dresses, suits, blouses, sweaters and skirts that I wear during the day. I want to look "nice" and most of my daytime wear would be considered appropriate in a dressy office. The thing is, I am often the dressiest dressed person at social places...and often the most covered up. I like my style, I mean after all, I have Audrey Hepburn as a Fashion Icon, but I don't want to be perceived as a "haughty fashionista", and I'm worried my look does that. And I must admit...I was wearing that dress at a lesbian venue, I know what you're thinking now and THAT is another story. Yes I suppose I could wear jeans and t-shirts when socializing, but that is not "me". It's hard to explain. Is there anyone else out there who feels similarly? She was sitting in the University Library, she looked as if she was waiting for someone, she was a little bit dressed up for a coed, she told me she preferred dressing nicely. She was the girl next door, sweet, in the full bloom of young womanhood...her name was Amaris." CC wears 5th & Oxford skins, everyone knows this. I am VERY skin picky, and while I freely acknowledge that there's a lot of great skin out there....I don't often wear it because it's not "CC". I have some very specific needs in a skin and it's hard to find my perfect skin. There are many who don't know this...but if all of my Roslin-made 5th & Oxford skin disappeared from my inventory and the entire grid, I would scream and tear my hair out in agony...and then I would head to Adam n Eve. Because even though I wear my Roslin-made skins almost all of the time, I DO wear other skins..and if you do see me in another skin these days, it's probably an Adam n Eve. Which is kind of funny, because I jumped from Adam n Eve to the TaP Deux's back in 2006. 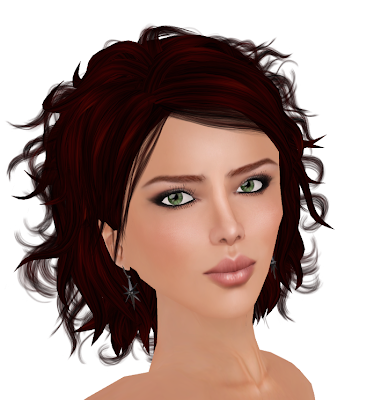 I have always considered Sachi-skin as I call it, to be among the nicest in SL. Well worth a trip to check them out. Okay look at this squeezable tush. Isn't it adorable. Goes back to ogling the tush again. Nice face isn't it. Smudged eyeliner, soft neutral eyeshadow, simple makeup suitable for a college coed. Very pretty and youtful as I said. The outfit itself is from Adam n Eve, mostly. The Sweater is the CC Sweater...and yes it's named for me. Look, it's no real big thing unless you have hair, a skin or a gown after you, those are the real prizes for fashionista bragging rights. :-) Ha ha ha. It's a nice simple little cropped cardigan..it comes in other colors as well. The shirt is the Billie Linen shirt...which has my favorite white shirt collar in SL, while cleavagey it is classic. The skirt is the shorter skirt from the Cora set (which comes with a very nice ruffly cleavagey poet shirt itself. Boots are the Madison Alpha Boots from Deco. You simply can't get the jewelry and eyes anymore...I miss you Miriel Enfield.